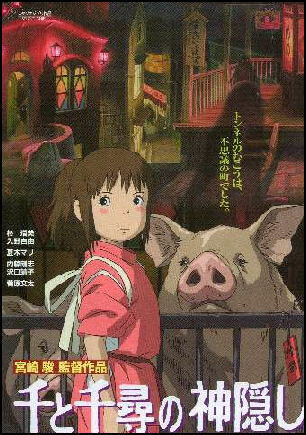 Spirited Away Movies are expensive in Japan. The price of single ticket can exceed $20. There are about 3,000 movie theaters in Japan. In recent years multiplex theaters have sprung up all over Japan. The first one was opened by Warner Mycal in 1993. The number of screens at multiplexes surpassed 2,000 in 2006. In January 2010, Toho Cinemas, Japan’s largest operator of movie theaters, said it was going to cut the price of movie tickets from ¥1,800 to ¥1,500 and tickets for people under 18 would be reduced from ¥ 1,500 to ¥1,000. 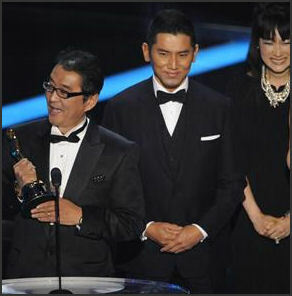 As of 2009, 15 Japanese films had been nominated for best foreign language film at the Academy Awards but none won until 2009. 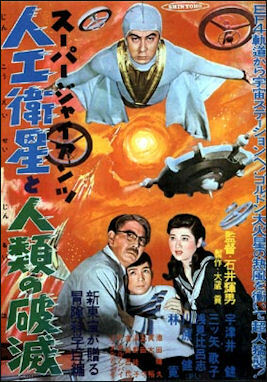 The Japanese films Gate of Hell by Teinosuke Kinugasa and Samurai I: Musashi Miyamoto by Hiroshi Inagaki won special awards respectively in 1954 in 1955 but the foreign film category was not created until 1956. Akira Kurosawa’s Rashomon received the special award in 1951. He won Best Foreign Language Film Award in 1975 for Dersu Uzala but that film was made for the Soviet Union not Japan. The biannual Tokyo Film Festival is held in October. It as first held in 1985. The 2006 festival featured 580 films from 65 countries. The best film award is called the Tokyo Sakura Grand Prix. The Tokyo Filmex is a new film festival that showcases mostly Asian films. Fukuoka also hosts an international film festival that highlights Asian film. In 2007 it showed 32 films from 16 countries. The 23rd Tokyo International Film Festival was held in 2010. The main prize is the Sakura Gran Prix In 2010, the festival introduced a “green carpet”---made from 23,000 recycled plastic bottles---to kick off the event. Among the 300 celebrities and film industry people that walked down the carpet were French actress Catherine Deneuve. The Japan Academy Prizes are the Japanese equivalent of the Academy Awards. Film organizations in Japan include the Motion Picture Producers Association of Japan Inc. and the Kinema Junpo Film Institute. The Nippon Connection in Frankfurt is the largest Japanese film and culture festival in Europe. 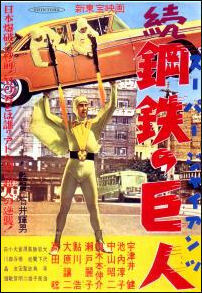 Camp Hero from the 1950s In 1996, only 200 million people went to see films at around 2,000 theaters in Japan. This was less than a fifth of the number of people who went in 1958. The biggest drop in the number of filmgoers and theaters occurred in the 1960s when television became popular. At that time, instead of trying to lure new customers with new marketing strategies, theater owners raised prices and drove even more people away. 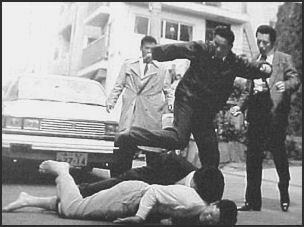 In the 1970s, the major Japanese studios Shochiku, Toho and Nikkatsu were in deep financial trouble. There was little money to produce innovative films or nurture new talent. As a result there were hardly any films that found an international audience were produced in the 1970s, 80s or early 1990s. 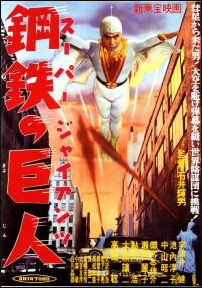 In 1975, for the first time the market share for Japanese films of total box office receipts fell below 50 percent. In 2002, the Japanese share shrunk to 27.1 percent with more than 70 percent of box office earnings coming from foreign, mostly Hollywood, films. In the late 1990s the most popular films were about 50 percent Hollywood, 30 percent Japanese and 15 percent Asian and 5 percent European. Many films praised by critics were made for film festivals such as Cannes. Some of these films won awards but didn’t draw audiences in theaters. According to a 1998 poll, 60 percent of the Japanese who were surveyed said they did not bother to go to the movies at all in the previous year and 22 percent said they one only went once or twice. Reasons for the decline in movie attendance include the high price of movies (up to $20 for a first run features), the reasonable price for home videos (about $3 a week) and absence of accessible movie theaters. 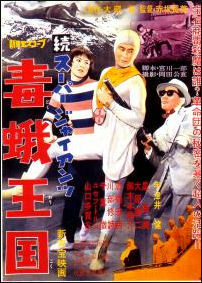 Camp Hero from the 1950s Once known for financing great films like the Seven Samurai and Tokyo Story, the Japanese film industry in the late 1990s and early 2000s was now known primarily for churning out predictable, formulaic gangster movies. The most popular movies in Japan came from Hollywood, with the ratio of foreign films (mainly from Hollywood) to Japanese films at Japanese theaters being about 2 to 1. Foreign theater developers were also moving aggressively into the Japanese market. The cartel nature of the Japanese film industry is largely responsible for the decline of Japanese film, which is dominated by three large companies: Toho, Shockiku and Toei. In 1996, Japanese film studios released only 64 films, down from 135 in 1987. Part of the reason for the drop off was the fact that film companies had invested their money in supermarkets and department stores instead of films. Influential film director and television personality Takeshi Kitano told Time in 1996, "I don't think 'terrible' quite describes the current state of the Japanese film industry. If there was a stronger world I would use it. The studios want huge Hollywood-style hits, but they also want artistic films. The result is a big mediocrity---an industry with no direction." Departures wins Oscar in 2008 By the early 2000s, theaters were taking in more money (over ¥200 billion in box office receipts), more films were being released and more and more Japanese films were doing well at the box office and being recognized at film festivals. The comeback began in 2003 on the coat tails of Howl’s Moving Castle by Hayao Miyazaki, which earned over ¥20 billion, quite a take for a Japanese movie. In 2005, 356 films were released the most since 1992. In 2006, for the first time in 21 years, domestic Japanese films outperformed foreign films at the box office capturing 53 percent of the market and earning ¥107.7 billion compared to ¥98,4 billion for overseas films. While the top three grossing films came from Hollywood (Harry Potter and the Goblet of Fire, Pirates of the Caribbean: Dead Man’s Chest and The Da Vinci Code) of the 50 films that earned more than ¥1 billion 28 of them were Japanese. A total of 402 domestic films were released in 2007, an increase fo 47 films from the previous year, and the first time the figure topped 400 since 1973. The rebirth was attributed to increased funding, particularly from television companies, and the rise of talented new directors and actors, the opening of multiplex theaters, and the decline in quality of Hollywood films. Many successful films and television shows in Japan have been inspired by manga series. Sometimes several films and television shows are inspired by the same series. Other succesful films have come firectly from television shows. Television stations like Fuji TV have also been a major source of funding, These companies are very competitive and have a steady source of income coming from television commercials which makes them immune to the boom and bust nature of the film industry. The television companies also have access to distributors and can promote their films on their stations. According to The Yomiuri Shimbun, "In the 2000s, films produced under the leadership of TV stations were doing well, and sales of domestic films exceeded foreign ones in 2006 for the first time in 21 years. But since 2008, there have been signs of the bubble bursting, as production companies collapse and theaters close. Some are concerned the trend could continue." 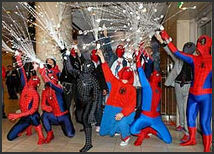 Spiderman 3 opens in Tokyo In the late 1980s Sony purchased Columbia Pictures for $3.4 billion. At first it seemed like a bad decision as the studio put out were huge money-losing films. In 1994, Columbia knocked $3 billion off Sony's profits. One of its films, Last Action Hero (1993) at the time lost more money than any other film ever. It cost $124 million to make and grossed only $44 million for a loss of $80 million. Sony was also hurt by a string of other money-losing films and a $400 million contract payoff to Hollywood producers Jon Peters and Peter Gruber. Later Columbia had successes with Spiderman, Men in Black, Stuart Little, Men in Black II, Stuart Little II, Crouching Tiger, Hidden Dragon, and Black Hawke Down. In September 2004, a group headed by Sony purchased MGM for $2.85 billion and took in $2 billion of the company’s debts. MGM had fallen on hard times, it was no longer producing many successful new releases but its library was regarded as very valuable in the booming DVD market. It also owns the rights to the James Bond films. Tora One of the most popular film series ever in Japan is the Otoko wa Tsuraiyo series, with more than 48 installments made between 1969 to 1995 by Toji Yamada. and featuring the itinerant peddler and traveling salesman Tora-san. The affable but childlike Tora-san, played by the irreplaceable Kiyosho Atsum, is the black sheep of his family for not working in the family sweet shop. In almost every film he falls in love with a woman he can’t have and makes a fool of himself in an endearing way, providing the basis for much of the comedy. 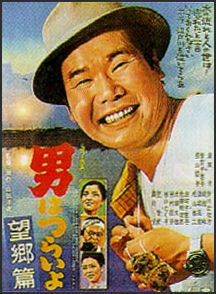 Atsumi’s 48 films as Tora-san is a record for most appearances by an actor in a single role) made between 1969 and 1995. When Atsumi died in 1996 the Tora-san character died with him. All but two of the 48 Tora-san movies were directed by Yoji Yamada, an extraordinarily prolific filmmaker (IMDB lists 110 titles in his filmography, both as a writer and a director) whose latest feature, About Her Brother, closed the recent Berlin Film Festival. Tora-san classic include It’s Tough to be a Man, the first of the series, features one of Tora-san favorite loves Sakura;Tora-san’s Spring, No, 24., in which Tora-san meet up an American peddler played by Herb Edelman; and Tora-san’s Tropical Fever, no. 25, director Yamada’s personal favorite, featuring the cabaret singer Lily (Ruriko Asao), the woman who came closest to marrying Tora-san. A park has been dedicated to Tora-san in Vienna, Austria of all places. Beat takeshi film Lowlife films from the late 1990s include Junk Food by Masashi Yamamoto, a story about a drug addict who feels sorry for a beaten-up prostitute so he shoots her up with heroin and makes love to her; Kamikaze Taxi by Masato Harada, featuring gangsters, pimps, prostitutes and right-wing politicians; Black Angel, Vol. 2 by Takashi Ishii. Fudoh: The New Generation, written by Tosiyuki Morioka and directed by Takashi Miike, is a manga-style, Godfather-influenced gangster epic with killer kids that shoot deadly darts from their private parts. At one point the heroine shoots a dart from between her legs through the ears of bad guy and darts sticks to a wall with parts of his brain attached. Miike has been described as the David Lynch and John Waters of Japanese film. As of 2004 he had made 60 films and was still only in his mid 40s. Many regard his bloody yakuza films---Dead or Alive, the insane Ichi the Killer and Audition--- as his masterpieces. Icho features a mentally retarded murderer who kills his victims with a razor in his shower, in some cases splitting them in them two. His 2004 release Gozu begins with the murder of a Chihuahua accused of being a yakuza attack dog. He also directed Noho Kuroshakai (1999) and Zebraman (2004). 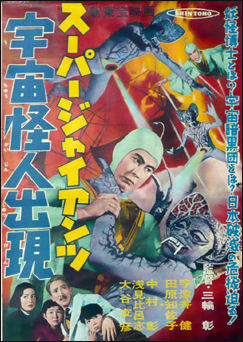 Camp Hero from the 1950s There are so many horror films produced in Japan some call the genre J-horror. 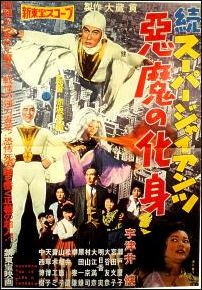 Many ghosts in Japanese films are women or children. Kwaidan, for example, is about a “woman of the snow” spirit who saves the life of a young woodcutter, caught by a blizzard, under the condition he never reveals what happens. He keeps the secret until he get married and tells his wife, only to find out she is the “woman of the snow.” But rather than kill him as she was supposed to do, she turns into snow and is blown out of the window, disappearing forever. Americans and Japanese react differently to different aspects of horror films. American want to be surprised and shocked but they also want explanation and structure with the events making some kind of sense while Japanese and Asians are more scared by ambiguous apprehension and don’t care so much whether it makes sense or not. They are more scared by a spooky atmosphere. What really scares a lot of Japanese is the look of the ghost. Traditional Japanese ghosts dress in white kimonos and have no legs. Arms are outstretched with dangling hands. Ghost stories are popular summertime entertainment. Among the well-regard film makers who have taken a stab at the genre are Kenji Mizoguchi and Masaki Kobayashi. Among their masterpieces are Mizoguchi’s Ugetsu (1953), selected by Time magazine as one of the “All-Time 100 Movies,” and Kobayashi’s Kwaidan (1964). Kiyoshi Kurosawa has produced highly acclaimed horror films such Cure and Kairo (which won a Cannes film award). Akarui Mirai (“Bright Future”) was given high marks by Japanese film critics. It is about a man who is executed for a crime he didn’t commit and allows his pet, a super poisonous jellyfish, to escape into local rivers where it multiples. Sakebi was an acclaimed ghost film made in 2007 that featured just as many laughs as screams and as much over-the-top absurdity as chills and suspense. Camp Hero from the 1950s The Ring (2002), an American horror based on a Japanese film, grossed more than $230 million worldwide. The original Japanese film, Ringu (1998) was directed by Hideo Nakata and was based on a novel by Japanese write Koji Suzuki and was a big hit throughout Asia. It was about people who die after watching a video cassette. Many believe the Japanese version was superior to the American one. Nakata made the Hollywood version for The Ring 2, which came out in its Japanese version in 1999. The $50 million Hollywood version was released in 2005 and wasn’t as good as the first Hollywood version or the Japanese version of The Ring 2 but still managed to hold the No. 1 spot on the American box office for a week in March 2005. It grossed over $140 million and earned Nakata enough credibility to get the nod to direct the Hollywood version of the Hong Kong horror flick The Eye. Another Nakata film. Dark Water (2002) was made into a Hollywood film starring Jennifer Connelly and directed by Walter Sales. . Nakata is well known in Japan. His other films include Chaos (1999) and Ghost Actress. The Juon was the first of a series of straight-to-video films written and directed by Takashi Shimizu, a young filmmaker who lot long before the series started was waiting tables in coffee shop and living in a $50 per month apartment to make ends meet. The film is about ghosts of man and his murdered wife and son that haunt a house and serve up trouble to the people that live there. Four Juon films have been released in Japan. They feature discreet use of weird ghosts. The Grudge”the Hollywood version of Juon also directed by Takashi Shimizu”was the No. 1 movie in the United States for one week in October 2004. The film stars Sarah Michelle Gellar of Buffy, the Vampire Slayer who plays an American architecture students visiting Japan who lives in a haunted house outside Tokyo. The film took in $39.1 million, beating out Shark’s Tale for the No. 1 spot, it first week and earned $110 million after two months. The original film was released only on video in the United States but developed a cult following. Margalit Fox wrote in the New York Times: Trained as a graphic designer, Ms. Ishioka was for decades considered the foremost art director in Japan; she later came to be known as one of the foremost in the world. Her outfits for “Bram Stoker’s “Dracula,”---directed by Francis Ford Coppola, included a suit of full body armor for the title character (played by Gary Oldman), whose glistening red color and all-over corrugation made it look like exposed musculature, and a voluminous wedding dress worn by the actress Sadie Frost, with a stiff, round, aggressive lace collar inspired by the ruffs of frill-necked lizards. These typified Ms. Ishioka’s aesthetic. A deliberate marriage of East and West---she had lived in Manhattan for many years---it simultaneously embraced the gothic, the otherworldly, the dramatic and the unsettling and was suffused with a powerful, dark eroticism. Her work, whose outsize stylization dazzled some critics and discomforted others, was provocative in every possible sense of the word, and it was meant to be. Ms. Ishioka was closely associated with the director Tarsem Singh, for whom she designed costumes for four films. In the first, “The Cell” (2000), she encased Jennifer Lopez, who plays a psychologist trapped by a serial killer, in a headpiece that resembled a cross between a rigid neck brace and a forbidding bird cage. “Jennifer asked me if I could make it more comfortable,” Ms. Ishioka told The Ottawa Citizen in 2000, “but I said, “No, you’re supposed to be tortured.”---For Mr. Singh, she also costumed “The Fall” (2006), an adventure fantasy, and “Immortals,” a violent tale of ancient Greece released last year. Their fourth collaboration, “Mirror Mirror,” an adaptation of “Snow White,” is set for release in March. Ms. Ishioka’s other film work includes the production design of “Mishima: A Life in Four Chapters,” Paul Schrader’s 1985 film about the doomed writer Yukio Mishima. That year the Cannes Film Festival jury awarded her---along with the film’s cinematographer, John Bailey, and its composer, Philip Glass---a special prize for “artistic contribution.” For the Broadway stage, Ms. Ishioka designed sets and costumes for David Henry Hwang’s 1988 drama “M. Butterfly,” for which she earned two Tony nominations, and, most recently, costumes for the musical “Spider-Man: Turn Off the Dark.” She won a Grammy Award in 1986 for her design of Miles Davis’s album “Tutu,” whose cover is dominated by an Irving Penn photograph of Mr. Davis, shot in extreme close-up and starkly lighted. Eiko Ishioka was born in Tokyo on July 12, 1938. Her artistic pursuits were encouraged by her parents: her father was a graphic designer, her mother a homemaker who, in accordance with the social norms of the day, had forsaken literary ambitions to marry and raise children.But when Eiko, as an undergraduate at the Tokyo National University of Fine Arts and Music, announced that she planned to be a graphic artist, even her father warned that she would have a much easier life designing things like shoes or dolls. Graphic design in Japan, with its close connection to the sharp-elbowed world of advertising, was every inch a man’s game then. The young Ms. Ishioka persevered, graduating in 1961 and joining the advertising division of the cosmetics giant Shiseido. She opened her own design concern in the early 1970s; among her chief clients was Parco, a chain of boutique shopping complexes for which she created advertising and promotional materials for more than a decade. Ms. Ishioka’s work for Parco, which embodied an eclectic, avant-garde internationalism rarely seen in Japanese advertisements of the period, helped cement her reputation. Her print ads, for instance, sometimes showed models who were naked or nearly so, a rarity in Japanese advertising then. Perhaps the most striking thing about Ms. Ishioka’s ads was that they rarely depicted any actual item sold at Parco. For Japanese television, she created a Parco commercial in which, over the course of a minute and a half, the actress Faye Dunaway, black-clad against a black background, slowly and wordlessly peels and eats a hard-boiled egg. In other work, Ms. Ishioka designed uniforms and outerwear for selected members of the Swiss, Canadian, Japanese and Spanish teams at the 2002 Winter Olympics in Salt Lake City. She was also the director of costume design for the opening ceremony of the 2008 Summer Olympics in Beijing. Ms. Ishioka’s portfolio extended to the circus and a magic show. She designed costumes for Cirque du Soleil’s “Varekai” (2002) and was the visual artistic director of the illusionist David Copperfield’s 1996 Broadway show, “Dreams and Nightmares.” She also designed costumes for the singer Grace Jones’s “Hurricane” tour in 2009 (they were noteworthy even by Ms. Jones’s lofty standards for the outré) and directed Bjork’s music video “Cocoon.” Her books include “Eiko by Eiko” (1983) and “Eiko on Stage” (2000), both available in English. Though she was known in particular for the form of her designs, Ms. Ishioka did not neglect function. For some athletes at the 2002 Winter Games, she created what she called the Concentration Coat, a full-length cocoon of foamlike fabric into which wearers could withdraw from the press scrum around them, podlike studies in portable solitude.